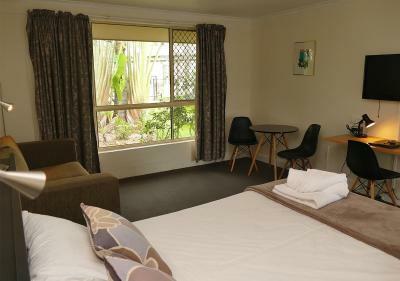 Lock in a great price for Ballina Byron Islander Resort and Conference Centre – rated 8.5 by recent guests! A beautiful pool and spa area made for a perfect place to spend the afternoon after a day of touring. While we did not seek it ourselves I overheard some very knowledgeable and helpful advice being given to some other guests who were after advice on their touring. Pleasant but basic stop over. Surpassed afairly low expectation with ease. Nice people. 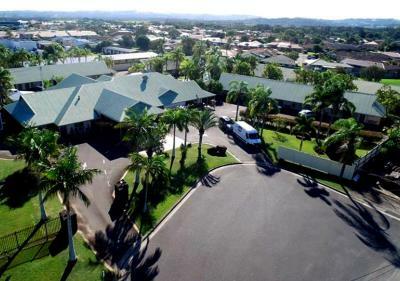 Great access to Byron bay and Airport. 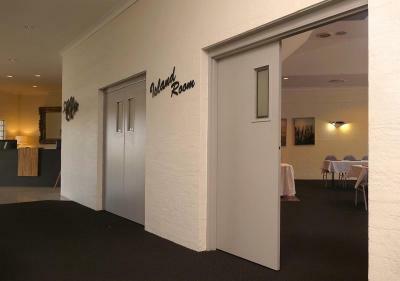 We had a meal on our return stay in the restaurant, we were tired and worn out after being in the car all day (Left Fraser Island that morning) the meal we had was absolutely gorgeous we had entree, main and dessert, which the kids loved. Best thing was we were all a little wind blown and not looking our best and the staff had no problem treating us like like 'normal' human beings. The bed was very comfy. The bathroom very old. We upgraded to a superior room for an extra $30, Basically to be further away from the road noise and king bed. We were en route to Brisbane. The location was excellent as it was just off the highway. The restaurant served a nice range and great food. Staff were friendly and personable. 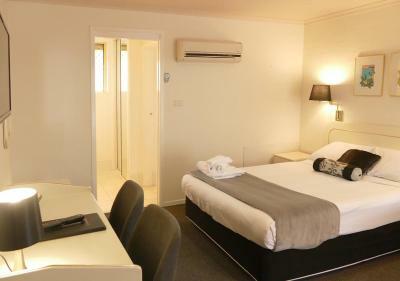 Ballina Byron Islander Resort and Conference Centre This rating is a reflection of how the property compares to the industry standard when it comes to price, facilities and services available. It's based on a self-evaluation by the property. Use this rating to help choose your stay! 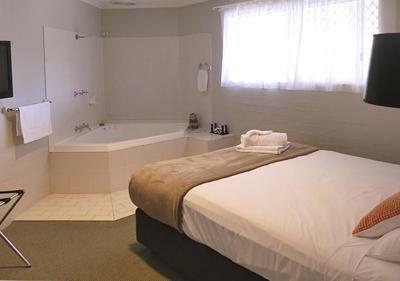 Offering free WiFi and cable channels, Ballina Island Motor Inn features a lagoon-style, salt water swimming pool and spa pool. 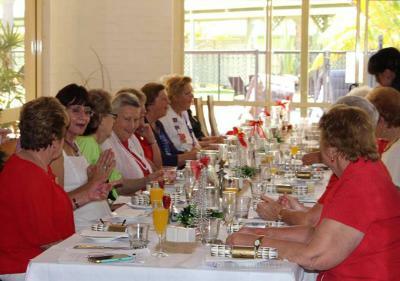 Guests also enjoy a restaurant, a bar and sunny courtyard. Free, unlimited WiFi is available. 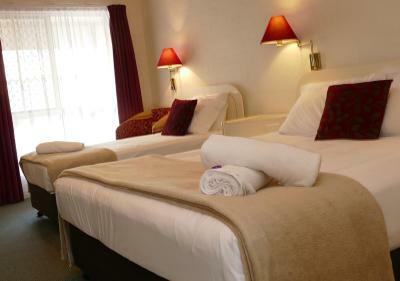 All rooms are located at ground level and offer their own car parking space. Each air-conditioned room is equipped with an LCD TV with cable channels, tea/coffee making supplies, a mini bar and ironing facilities. Laundry facilities are available. Secure parking is available for large vehicles, boats, buses and trailers. The covered courtyard overlooks the landscaped pool area. Room service and luggage storage facilities are available. Guests can enjoy complimentary bike hire. 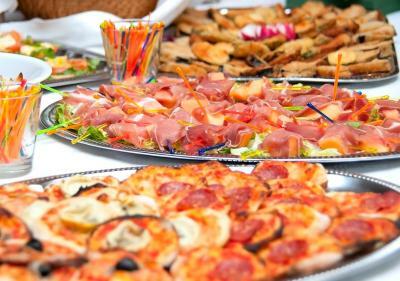 Located within a tranquil garden setting, the property features a fully equipped function and conference center, suitable for up to 110 guests. Each room includes their own car parking space. Ballina Island Motor Inn is an 8-minute walk from Keywest Shopping Center and Westower Tavern. 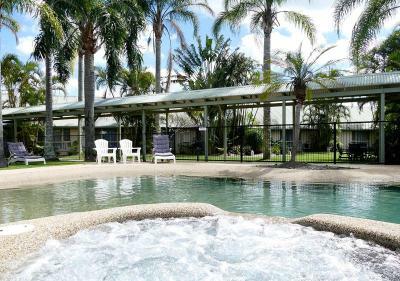 It is a 5-minute drive from from Ballina town center and Ballina Fair Shopping Center. The property is 10 minutes' drive from Lennox Head and Byron Bay is just 25 minutes' drive away. 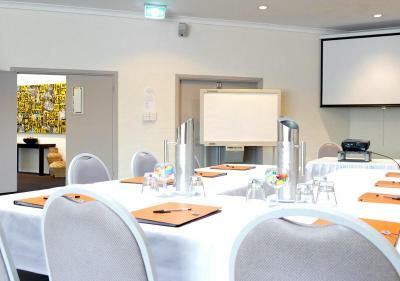 When would you like to stay at Ballina Byron Islander Resort and Conference Centre? 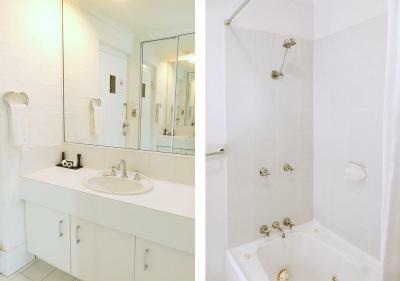 This ground floor, air-conditioned room has an private bathroom and a queen-sized bed. It is located at the side of the property and overlooks the mini citrus grove. The room has opening, security screened windows, outdoor seating, complimentary toiletries and tea/coffee making facilities. There is a bar fridge, toaster, hairdryer, iron and ironing board and a flat-screen TV with 16 complimentary cable channels. 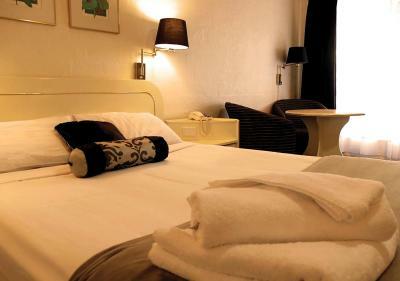 Complimentary unlimited WiFi, free bicycle hire and free use of laundry facilities are included. There is free car parking outside your room along with free parking for boats, vans, caravans and buses on the property grounds. A portacot, microwave, crockery and cutlery are available on request. 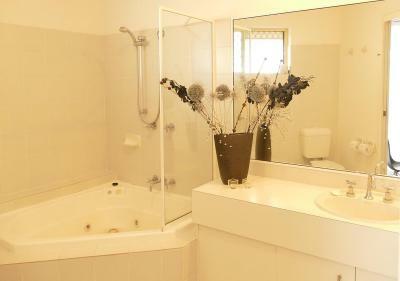 This spacious, modern, ground floor room is air-conditioned and has an private bathroom. 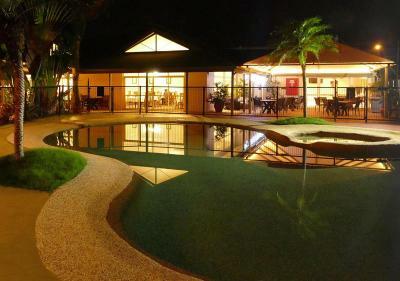 It is located at the back of the property, overlooking the lush tropical garden. It is larger and has a queen-sized bed, single-sized bed, mini-bar, work desk, dining table and chairs as well as opening security screened windows. 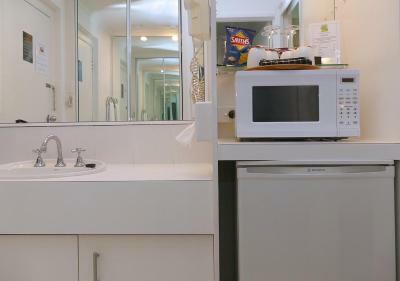 There is an outdoor seating area, complimentary toiletries, tea/coffee making facilities, a flat-screen TV, bar fridge, toaster, hairdryer and ironing facilities. 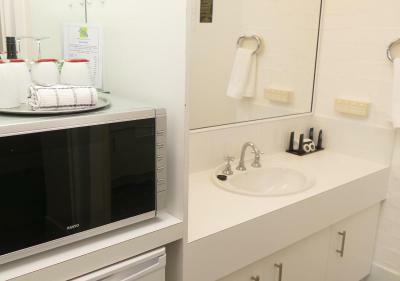 A portacot, microwave and both crockery and cutlery are available on request. 16 complimentary cable channels, free unlimited WiFi, free bicycle hire and free access to laundry facilities are included. Please note that the maximum occupancy is 3. 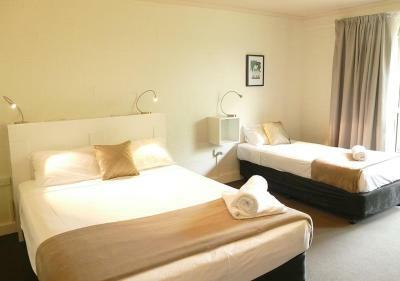 Interconnecting twin rooms are available on request, subject to availability. 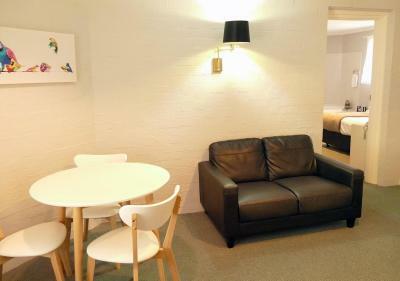 It is larger and has 2 rooms, 1 with a queen-sized bed and 1 with 2 single-sized beds and a sofa bed. 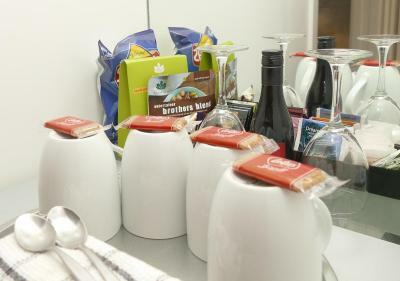 There is a mini-bar, work desk, dining table and chairs as well as opening security screened windows. 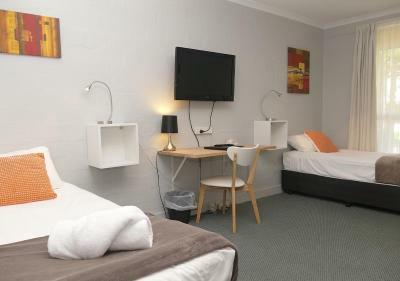 There is an outdoor seating area, complimentary toiletries, tea/coffee making facilities, a flat-screen TV, bar fridge, toaster, hairdryer and ironing facilities. A portacot, microwave and both crockery and cutlery are available on request. 16 complimentary cable channels, free unlimited WiFi, free bicycle hire and free access to laundry facilities are included. Please note that the maximum occupancy is 6 guests. It is larger and has a queen-sized bed. There is a mini-bar, work desk, dining table and chairs as well as opening security screened windows. There is an outdoor seating area, complimentary toiletries, tea/coffee making facilities, a flat-screen TV, bar fridge, toaster, hairdryer and ironing facilities. A portacot, microwave and both crockery and cutlery are available on request. 16 complimentary cable channels, free unlimited WiFi, free bicycle hire and free access to laundry facilities are included. Please note that the maximum occupancy is 2 guests. It is larger and has a queen-sized bed and a single-sized bed. 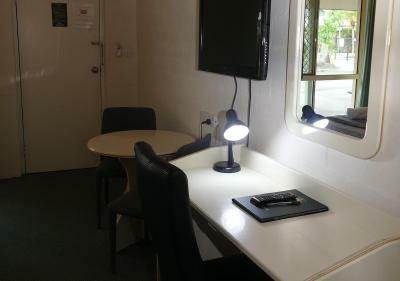 There is a mini-bar, work desk, dining table and chairs as well as opening security screened windows. 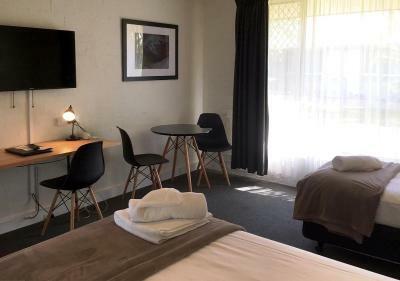 There is an outdoor seating area, complimentary toiletries, tea/coffee making facilities, a flat-screen TV, bar fridge, toaster, hairdryer and ironing facilities. 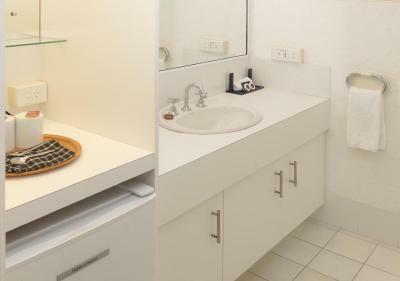 A portacot, microwave and both crockery and cutlery are available on request. 16 complimentary cable channels, free unlimited WiFi, free bicycle hire and free access to laundry facilities are included. 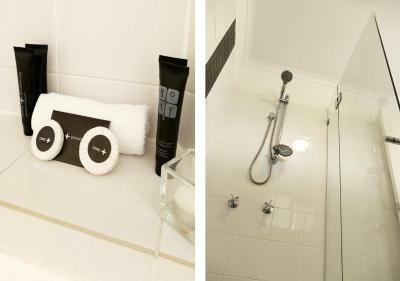 The room has been specifically designed to be accessible for people who may use a wheelchair as it has a spacious shower, mobility rails and shower chair. This contemporary, stylish, spacious, ground floor room has air-conditioning, a queen-sized bed and an private bathroom with a corner spa bath. It overlooks the resort-style pool and spa. 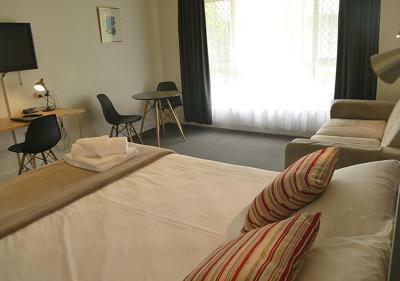 The room has modern Scandinavian decor, a private outdoor seating area, pod coffee machine, gourmet herbal tea selection, extended mini-bar and both early check-in and late check-out. 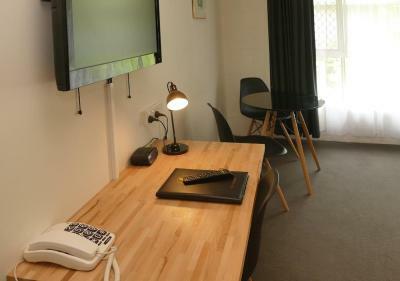 The rooms have a work desk, dining table and chairs, a sofa as well as opening security screened windows, outdoor seating, complimentary toiletries, tea/coffee making facilities, a bar fridge, toaster, hairdryer, iron and ironing board as well as a flat-screen TV with 16 complimentary cable channels. 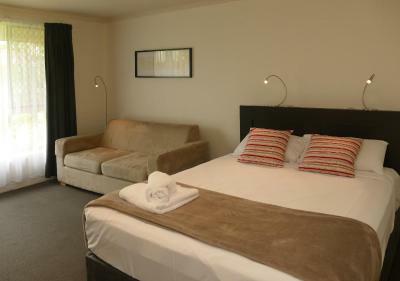 Complimentary, unlimited WiFi, free bicycle hire and free use of laundry facilities are included. Free car parking outside your room along with free parking for boats, vans, caravans and busses on the property grounds. 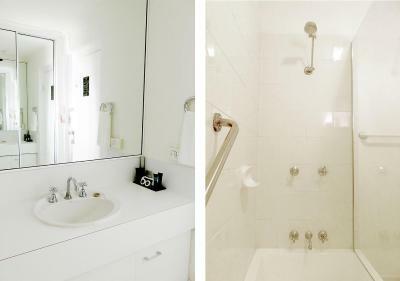 This contemporary, stylish, ground floor room is air-conditioned and has an private bathroom with a spa bath. 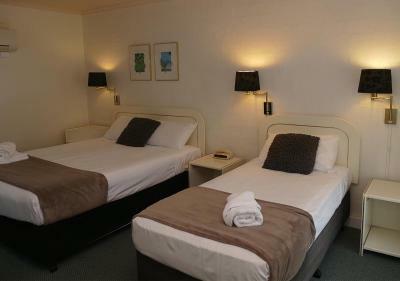 It has 2 rooms, 1 with a queen-sized bed and the other with 2 single-sized beds. There is another separate bathroom with a walk-in shower. The room overlooks the resort-style swimming pool and spa. 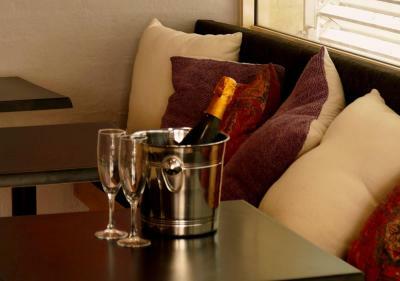 It has modern Scandinavian décor, a private outdoor seating area, pod coffee machine, gourmet herbal tea selection, extended mini-bar, and both early check-in and late checkout. 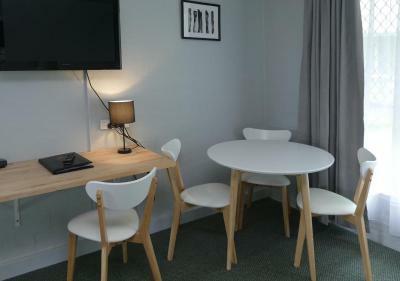 There is a work desk, dining table and chairs and a sofa in the as well as outdoor seating, complimentary toiletries, tea and coffee making facilities, flat screen TV, bar fridge, toaster, hairdryer, iron and ironing board. Free cable channels, free unlimited WiFi, free portacots, free bicycle hire and free access to laundry facilities are included. Please note that the maximum occupancy is 4. 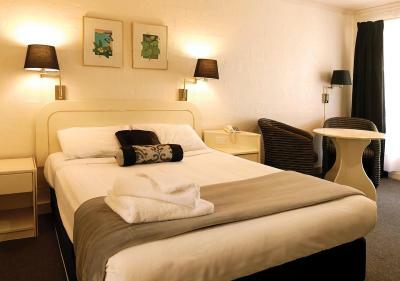 This ground floor, air-conditioned room has an private bathroom, a queen-sized bed and a single-sized bed. It is located at the side of the property and overlooks the mini citrus grove. The room has opening, security screened windows, outdoor seating, complimentary toiletries and tea/coffee making facilities. 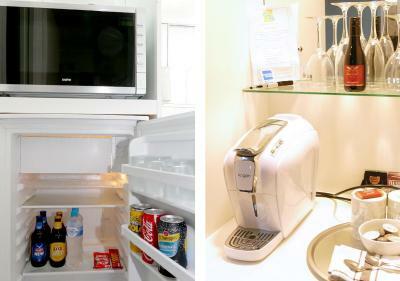 There is a bar fridge, toaster, hairdryer, iron and ironing board and a flat-screen TV with 16 complimentary cable channels. 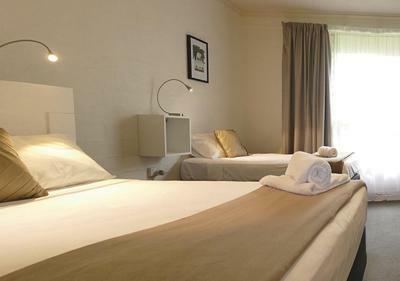 Complimentary unlimited WiFi, free bicycle hire and free use of laundry facilities are included. There is free car parking outside your room along with free parking for boats, vans, caravans and buses on the property grounds. A portacot, microwave, crockery and cutlery are available on request. Maximum occupancy is 3. 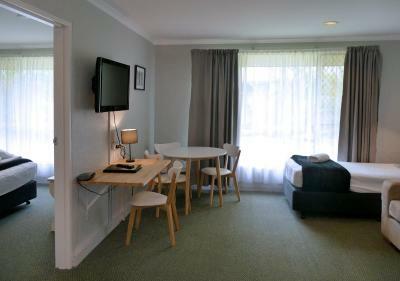 Interconnecting twin rooms are available on request, subject to availability. 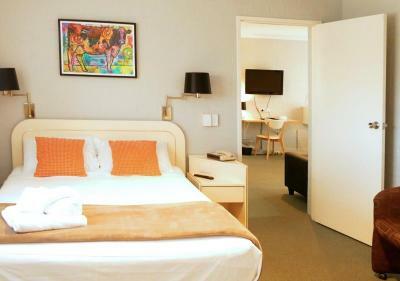 This contemporary, stylish, spacious, ground floor room has a king-sized bed. 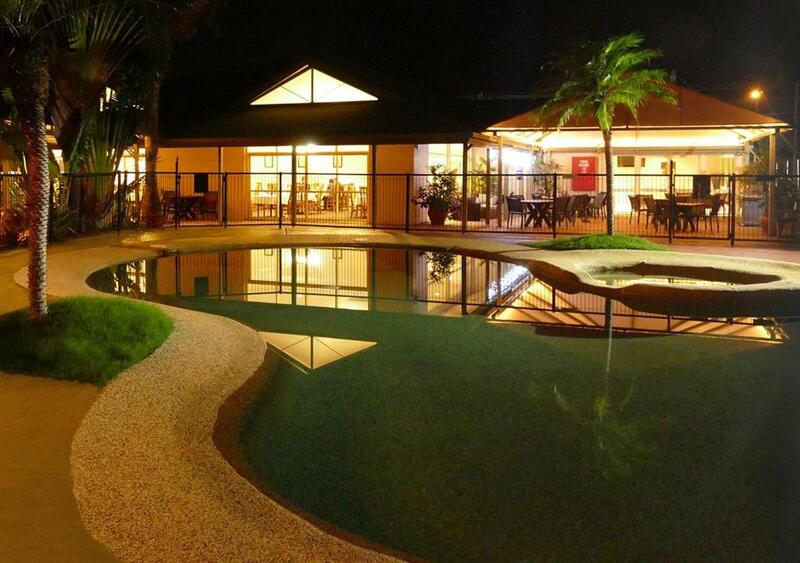 It also includes air-conditioning and overlooks the resort-style pool and spa. 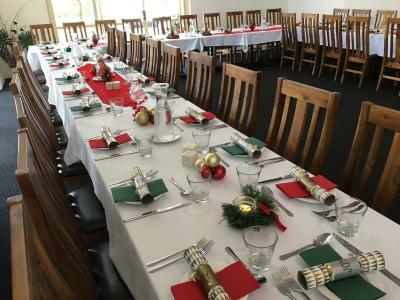 House Rules Ballina Byron Islander Resort and Conference Centre takes special requests – add in the next step! Ballina Byron Islander Resort and Conference Centre accepts these cards and reserves the right to temporarily hold an amount prior to arrival. Please inform Ballina Byron Islander Resort and Conference Centre of your expected arrival time in advance. You can use the Special Requests box when booking, or contact the property directly using the contact details in your confirmation. We picked this place to stay because of the restaurant. Very disappointed. The main we wanted was sold out only half an hr from being open and there was only 2 other tables filled. We ordered a different main and they had no vegetables left. The desert we ordered was not nice either. I would stay for a night but I wouldn’t eat at the restaurant again. We have asthma and rooms were musty and dust had settled on chairs and blankets so it was difficult to sleep with breathing difficulties. We also didn’t realise the area where dog is kept would be so small, and the baby gate to keep them in is quite flimsy. There’s no designated outdoor area to walk your dog either so it’s a little hard. The website paints the place as a resort and rooms look like they have terraces and coffee machines but that’s only deluxe rooms. Aside from the pool there’s no river or beach access. The pool is amazing and you can get beach towels from reception. Loved that you can take your pet even if you can’t leave them unattended. Breakfast is good. Very dissatisfied with the way the manager dealt with discrepancy in relation to incorrect information provided on Booking.com. It was a long way from the Main Street. Pool was disappointing. Didn’t look the same as the pictures online. I love this place. it is exceptional value in a quiet place, whilst central to everything one might need. 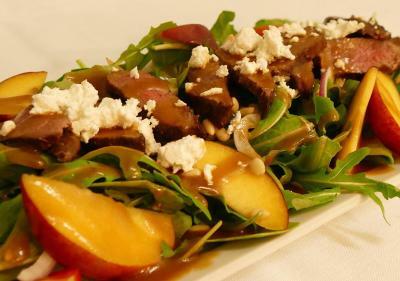 the food at the restaurant is great. I love that i can checkin, and then head to my room and i am simply not bothered by anyone. the place is always clean, and there is a bathtub! Its a perfect pitstop when im travelling up and down the coast. I actually take an extra day to stay on my way back through just because i enjoy it so much here. Room was old and tired. Exposed wiring in bedroom and had to turn tv off and on at PowerPoint to get it working. PowerPoint had been painted over and hard to turn off and on. Needs to be brought into the 2010’s not 80’s.